​Most people associate angle grinders with flying sparks seen in metal workshops or in large construction sites. I assure you there’s more to angle grinders than that. When it comes to versatility, angle grinders can really do a lot. They are handheld power tools that can perform different tasks ranging from metal cleaning, polishing, and sharpening cutting edges, to cutting objects such as bars and rods, pavers, stone, concrete or even removing old mortar. The abrasive disc on the angle grinders is responsible for cutting through the various substance. Although the discs look similar, they’re designed for different cutting tasks. Angle grinders got their name from the task that they are mostly used for. When you turn the angle grinder, you can use the edge to make really deep cuts on different substances. However, the flat end of the disc can also be used for polishing and wearing out different materials. Although the abrasive disc can cut through any material, they are best used on hard materials such as metals and stones. Using them on soft materials such as wood will cause the material to melt or catch fire because they won’t be able to withstand heat buildup during cutting. For cutting wood we recommend using a miter or a circular saw. 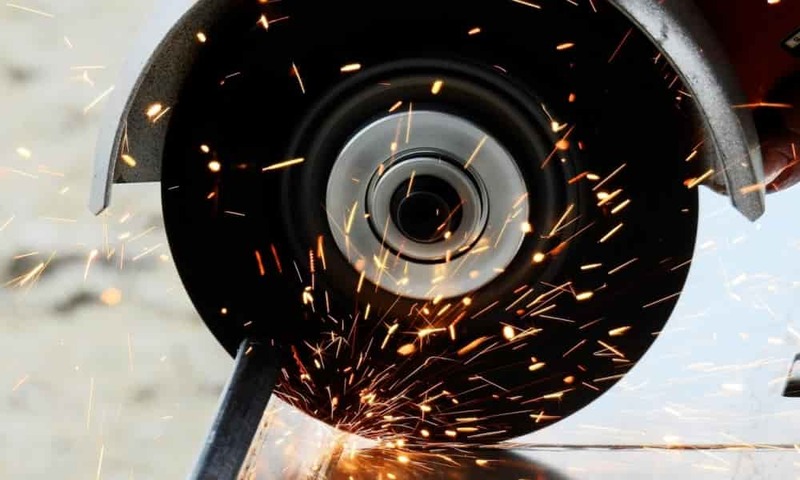 While the angle grinder is widely used in metal workshops together with drill presses for drilling through metal and construction sites, it also finds a lot of uses in the home, a service garage, or an auto repair shop. There will always be the need for you to cut to through a hard material either to perform emergency rescues, to manufacture another object, to make things fit into trash bins more conveniently or to sharpen and polish your garden tools. Cutting steel bars or rods, metal sheets, bolts, and screws. Sharpening cutting edges of garden tools such as axes, shears, shovels, and other chopping tools. This same job also can be done with a bench grinder. Cutting pavers, bricks, slab blocks, tiles, and also rooting out old mortar. Cleaning rust, paint and caked-up cement from metal surfaces. For example, cement mixers, gates, and fences, trowels and spades etc. Shaping objects and materials. You need some level of expertise to achieve this. There are four major types of angle grinders, each having their own peculiarities, pros and cons. Selecting the correct angular grinder for a job will make you carry out the job more efficiently. polishing. Since they are powered by electricity, they can only be used where you have a nearby electrical outlet. So, getting an electric angle grinder with enough cord length is essential, however, you can extend the range with an extension cord. With an electric angle grinder, you can work for many hours without interruptions as long as you’re always connected to electric power. Large angle grinders will most times be electric and more powerful, making them require an additional handle to support the tool during operation. Battery operated angle grinders run on battery, so they don’t require electric cords. This ability makes it easier to move them about during operation and transportation from one work area to another. You can use them in high locations without having to bother about the proximity of an electrical outlet. However, they have limited run time before the batteries need to be replaced or recharged. How long a battery lasts depends on the type of the battery and the voltage capacity. Lithium-ion batteries are more preferred to Ni-cad batteries because they last longer and can be recharged easily. It’s better to have a backup battery if you’re opting for a battery-powered angle grinder so you can use it while charging the replaced one. This type of angle grinders makes use of air pressure supplied by air compressors to operate. They are usually very powerful and cheaper than other types of angle grinders, but when you add in the cost of an air compressor, they could be costlier. If you already have an air compressor in your store, then this type of angle grinder will be perfect for you because it’s less expensive. Although this tool is available in a small size, it produces a lot of power, sometimes more than electric ones. Similar to other types of grinders, it is also possible to attach an additional adjustable handle and a safety guard. This is also a type of cordless angle grinder in which gasoline is used to power their motor rather than electricity. They are usually the most powerful angle grinders available, having enough power to perform the most difficult tasks. However, they are quite heavy and can be very expensive to maintain. You need to constantly refill for them to function ceaselessly. Each task carried out with angle grinders either polishing, cutting or grinding, have discs that are purposely assigned for them. Attempting to use say a cutting disc to grind or vice versa will only damage the disc. Stone cutting discs can actually be used to cut metal but it can tear up and damage the disc, it can also cause serious injury to yourself or people around you. Reading the label on the discs with the materials you can use them on is easier to understand. Let’s look at the different type of attachment discs we have so you can know which one to use for any task you need to perform with an angle grinder. ​This type of disc can be used to cut through tiles, slates, marble asphalt, granite, and other abrasive materials. Their tips are made of diamond so they are hard enough to cut through the earlier mentioned hard materials. You need to check if the disc is either dry or wet cut before purchasing a diamond cutting disc. Dry cut discs can be used without water while wet cut discs need to be kept wet when cutting. ​They really do what they say on the tin. Stone cut off disc can be used for cutting stones or bricks while metal cut off discs can be used for cutting metal objects. They come in both stone grinding and metal grinding types. They can be used for grinding stone or metal to either shape it or remove lumps. ​These are basically just pieces of sandpaper that can be used to wear off and smoothen surfaces. They are easily replaced because they possess a method of attachment that can be fixed to a soft base to be attached to the angle grinder. You can change the sandpaper once the current one is worn down and replaced with a new one. They are majorly used for polishing and finishing harder surfaces. They are screwed on to the threaded portion of your angle grinder to be tightened with a spanner. Similar to the sandpaper, polishing heads can then be fixed to the pad. ​These attachments allow you to remove paint and rust off surfaces easily. They come in groups of wire brushes located around the perimeter of the cup. The cup can then be screwed onto the angle grinder but makes sure they are well tightened with the use of a spanner. When the angle grinder is turned on, the metal brushes start to twist and spin at very high speeds making it easy to remove rust and paint easily. They are very versatile and can be a very useful disc to get for your angle grinder. They are majorly used for sanding and cleaning up surfaces but they can also do a little grinding. They are similar to the disc used for sanding with a benchtop disc sander. They can prove to be the best solution if you need to do some fine because they are not as harsh as a proper grinding disc. Angle grinders spin at dangerous speeds of about 10,000 rpm. Any slight mishap could lead to a very serious injury. That’s why you need to follow safety instructions and precautions in order to ensure your safety and those around you while operating the tool. Everybody within your work area should wear safety glasses, hearing protection and gloves. A flying particle might not cause much problem if hits your body but can cause injury if it hits your eye. This is why you should put on safety glasses when operating an angle grinder. Gloves protect the hands from heat produced by the grinder. 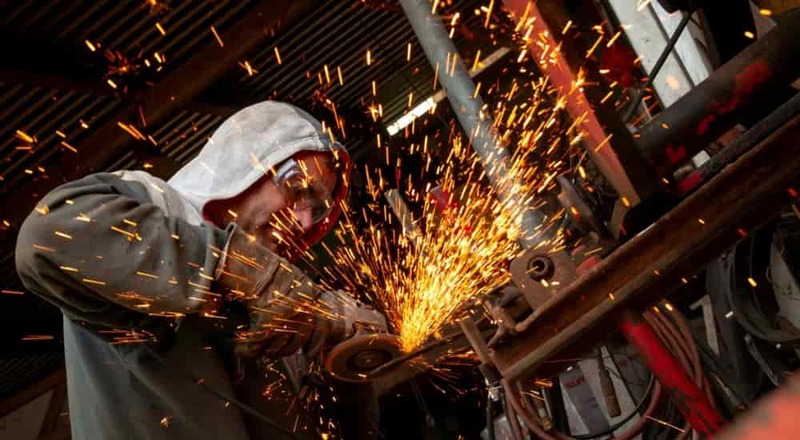 Burn is one of the most common injuries caused by a grinder because the operator might mistakenly touch the red-hot metal piece after the grinding is complete. Angle grinders can be very loud during operation, hearing protection is also essential to prevent hearing loss. Also, put on work pants when cutting hard materials such as metals. Flying streams of red-hot metals are produced when cutting, this might cause your pants to get burnt slightly. The sparks are not strong enough to burn your skin, but it doesn’t hurt to be prepared for the worst cases. Test new discs for at least one minute in a safe area and make sure they are not damaged before using them. Orient the work so the wheel spins away from sharp edges. There is a tendency for wheels to catch on an edge causing the grinder to kick back. Keep flying sparks away from flammable materials. 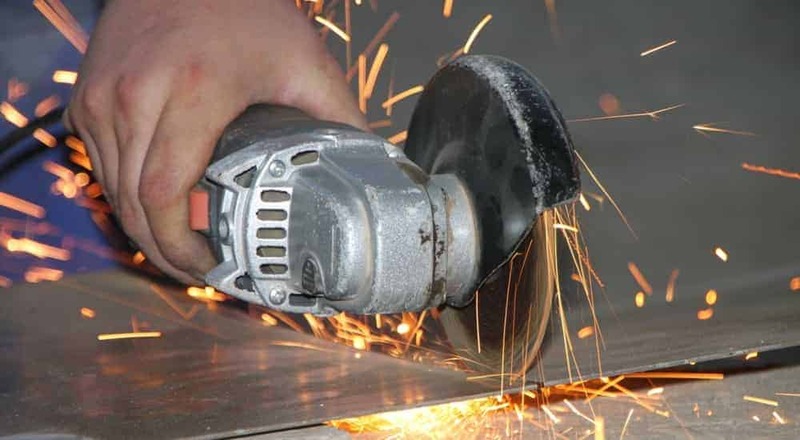 There are several factors to consider when choosing an angle grinder. Whether you are buying it for home jobs or commercial purpose, it is still pertinent that you find the best tool that will suit your needs. A grinder’s size is usually determined by the wheels rather than the length of the tool. Big sized angle grinders come with large wheels making them suitable for professional grade jobs and other heavy-duty jobs. Small sized angle grinders are more efficient in performing smaller tasks and tasks that require more precision such as sharpening and polishing metals. This is because their wheels spin at a faster rate. Choose your angle grinder, either big or small, depending on the type of tasks you need it to perform. Angle grinders with high power motor are used majorly for heavy-duty construction site tasks. Motor power is usually determined by the voltage, wattage, and amp rating. These factors vary between the grinders. The motor also determines the speed with which the disc rotates. Most handheld grinders produce about 5,000 to 10,000 revolutions per minute. Always try to use a safety guard that covers part of the grinding wheel. Handle and store wheels properly. Storing them in areas that are not subjected to extreme temperature changes will go a long way in extending their lifespan. Don’t force a wheel onto the tool or alter the size of the mounting hole if it doesn’t fit. Instead, get one that fits. Don’t use a wheel on a material is not designed for. Doing this might damage the wheel or cause personal injury. Always inspect your angle grinder and all discs for possible damage before mounting. Replace cracked or damaged discs. Don’t exceed the safe operating speed specified by your tool’s manufacturer. ​Q: Can angle grinders cut wood? A: Yes. However, it’s not advisable to use angle grinders to cut wood because it carries a lot of risk of injury to the tool operator. Angle grinders spin at extremely high speeds. If the blade snags while making woodcuts, the kickback of the tool could be extremely dangerous. For a task like carving, sanding or cutting wood, we recommend using tools like Dremel for work with wood. A: Yes, all you need to do is attach flap discs and you’re good to go. Q: what size angle grinder should I buy? 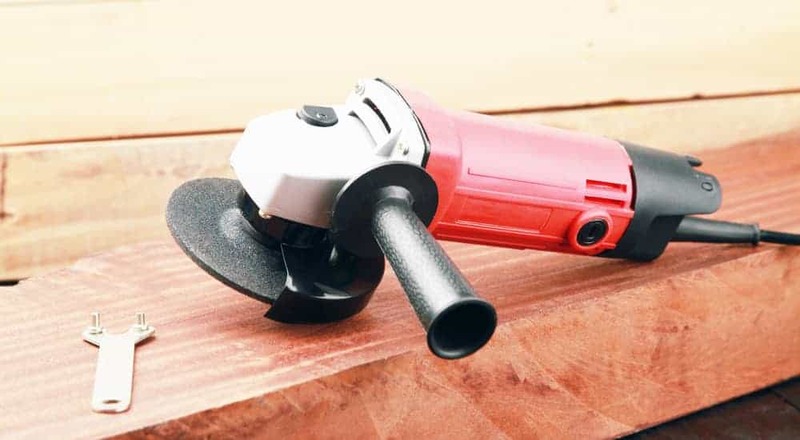 A: A 4.5-inch diameter angle grinder is suitable for most workshop tasks but if you need to make larger cuts you can get angle grinders with a diameter greater than 7 inches. Q: what is angle grinder kickback? A: An angle grinder kickback occurs when the rotating wheel snags on an object causing it to suddenly kickback. Take extra care when working on sharp edges and corners, and maintain a proper posture to reduce the effect of kick back in case it occurs. An angle grinder is a tool you need to add to your tool chest because it allows you to cut anything any of your other tools can't. And it will also find regular use when you need to sharpen your metal edges or clean off debris, cement or rust from them. A 4.5-inch angle grinder is great for all sorts of light construction tasks and home repair projects. but for larger cuts and bigger depths, you can get other sizes. An angle grinder is also one of the most entertaining tools to operate. most DIYers will agree. Select an angle grinder based on the above factors and also the type of jobs you need it. It should also be an angle grinder that fits into your budget. You can get a couple of good ones at low prices too.